I’m a massive fan of Clearview Stoves. They are build like tanks, are easy to use, controllable and crucially the glass at the front always stays clear. My parents have had a Clearview stove for a long as I can remember and I had one put into our last house. We used it for 4 years and loved it. We recently moved house and it didn’t have a wood burning stove. I wanted to put one in. The natural option would have been to put in a Clearview Pioneer 400 or a Vision 500 but our new house is quite modern and the Clearview’s has very traditional appearances. If you talk to a woodburning stove sales person, they always say ‘every stove now has the same system as the Clearview and the glass always stays clean…’. I know this isn’t true because I have a number of friends and relatives with a variety of brands which don’t burn cleanly. So, I did lots of research and I found the Contura 51L (Note: This stove used to be known as a Handol 51l). It has got hardly any reviews online but most say it’s excellent and after much deliberation we decided to go with this stove. Now after using the Contura 51l for a little while, I thought I would write a direct and detailed comparisons of Contura and Clearview to help someone else make the decision. I will keep updating this post with additional comments as I use the Contura stove. Glass Cleanliness – Both the Contura 51l and Clearview stoves have similar levels of glass cleanness. The Clearview used to ‘mist’ up slightly around the corners when shutdown really low (for example when wanting to keep the stove running overnight). This misting would clear as soon as the stove was fired up again. The Contura doesn’t seem to do this. The Contura glass does get slightly dustier than the Clearview and so I tend to wipe the glass every 2 weeks (burning each night). Ease of lighting – Both stoves are easy to light. I found the fastest way of lighting both stoves is to load them up with paper and kindling. Then put a log on the top and light the paper. I tend to leave the door open a tiny bit so that the air is drawn into the stove really fast which quickly grows the flames. Once the log is burning nicely then I would close the front door properly. The Contura door lock is actually designed to do this while the Clearview isn’t. Build quality – The Clearview and Contura have similar build quality. The Contura is mostly cast iron. The Clearview is made of heavy steel with a cast door. The Contura has a slightly smoother finish than the Clearview and feels less agricultural. The details on the Contura are more refined. For example – the air flow control slider at the bottom of the Contura run smoothly while the Clearview air venting handle grates a little as you pull it back and forth. Contura are a very large company mostly making sheet steel stoves for the continental European market. You can see a video on their factory here. Handle and Door – The Clearview has a handle on front left hand side. The Contura handle is on the right side. The Clearview handle is not removable. The Contura is optionally removable. Both get hot. I have kept my Contura’s handle fixed because I don’t want to loose it or scratch it. Contura door is sprung loaded which means it tries to close all the time while it is open which means it’s a two handed operation loading and generally messing with the fire. The Clearview door isn’t sprung loaded and can be left open which is much more convenient. The Clearview handle locking mechanism is a little more agricultural than the Contura. The Clearview handle is on a screw and you can vary the door tightness but unwinding the handle. It’s quite easy to accidentally over or under tighten the door. On the odd occasion, when the Clearview is really hot, I could barely open the door and had to use a log to bang the handle open. The Contura door handles isn’t adjustable and works slightly more smoothly. Installation – The Contura 51l is rated at between 3-7kw with a nominal output of 5Kw. This means that you can install the Contura 51l without an air vent but you can run the stove up to 7kw. This is a bit of number fiddling on Contura’s part. Our house isn’t very well sealed and so I wasn’t worried about not having a vent. If you choose the Clearview Pioneer 400 then it doesn’t need an air vent but can only reach 5kw. If you choose a Clearview Vision 500 then you need an air vent but can’t achieve 8kw. 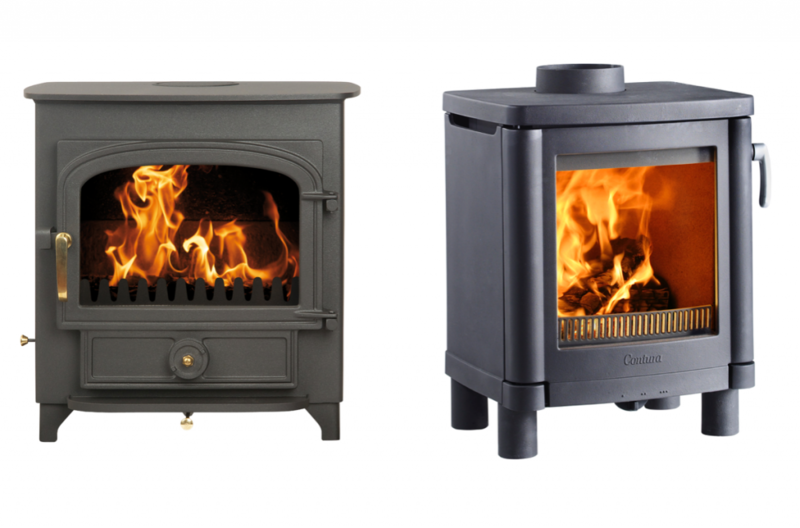 Multi fuel – Clearview stoves are multifuel while the Contura 51l isn’t. This wasn’t a problem for us because we only like to burn wood. If you really want to burn coal then you would need a Clearview. However, you should be aware that the sulfur in coal can damage our your chimney lining. Log Size – The Clearview Vision 500 has the best of log length at 380mm. This is closely followed by the Contura 51l with a maximum log length of 350mm. Clearview Pioneer 400 – 25cm (10”) approx. Viewing – The Contura 51l has the largest viewing windows and is about 20% larger than the Clearview Vision 500 and 50% larger than the Clearview Pioneer 400. Here the rough measurements. Responsiveness – The Clearview is very slightly more responsive to air flow adjustment than that Contura. Cleaning out the ash – I found the Clearview stove easier to keep clean. The Contura seems slightly harder to clean out because ash can build up on the front ledge of the stove is easier. Price – Most stoves are at the more expensive end of the market. The Contura 51l is roughly £200 cheaper (15%) than the Clearview. The Contura 51L is an excellent alternative to a Clearview stove and having used a Contura – won’t be going back to Clearview. If you are a Clearview convert but need something more modern then the Contura 51l is the stove for you. It would seem sensible for Clearview to produce a more modern range using their stove technology to avoid losing sales to their competition. I hope their helps someone. Please leave a comment if you want more detailed info or have feedback. The current Contura 51L although shown as 5kw is rated up to 7kw and the Clearview 5kw so how can you compare the two. You don’t just buy a stove based on the rating. You look at cleanness, viewing angle, style, door systems etc etc. In any case, the Contura nominally runs at 5kw and can we stretched to 7kw which nicely covers both clearview products. Thanks for such a helpful comparison. We have two clear view pioneer 400s and are very loath to “downgrade” to anything else. However we need a modern cassette stove and in view of your comparison think we might have found the solution we are looking for. This is a really helpful comparison. We are just at the point of buying our first stove and agonising between the Pioneer 400 and the Contura 51L… Your very detailed guide (and also one from an experienced user) has helped us to settle on the Swedish product, although I do feel a bit guilty about not buying British! Thanks again, James! You won’t regret it. My hope is that at some point Clearview will do some more innovation and update their product range. Hi have just bought and installed a contura 51l but always in the back of my mind was I should be buying clearview. Reading your clear review has really helped and I just wanted to say thanks for taking the time to do this. Great. Let me know how you get it and if anything was missing from my comparison. Just getting to grip with the fire now. Burn rate is about one far log power hour which is great and not a also of soot on the glass. However one difference that I am noticing between my contura and the clearview is a lack of instant control with the contura. When I close the air intake on the contura it takes about 5 minutes to really notice the effect whereas the clearview in the showroom seemed to react instantly when the air was turned down. Equally when turning down I don’t get the ‘dancing flames’ effect that is so obvious on the clearview. Do you have the same experiences? Thanks for the feedback. I agree the responsiveness of the Clearview is better than the Contura. I never used to shutdown the Clearview trying to achieve the dancing flame effect but know exactly what you are referring too. I will update the post to this in. I have a Contura 51L and could not be happier. Its our first stove so cant compare it to any others but its fantastic. I find its controllability superb- the stove reacts immediately to a change in the air setting. I am constantly amazed by how clear the glass stays and how great it is to look at when on. Thanks for posting more information about the 51L. I love the stove but am having issues with the control of the air. Basically I have little to no control. When I put new logs in the stove they will burn at full power for at least 20 minutes even with the air control on one. I’m guessing that this is not what you are experiencing. If you could have a look at these two videos and let me know I’d be very thankful. Even better still if you could post a video of how you fire responds when you move the air control. Hey Karl, here is a video of my stove. I’m moving the vent between fully open and fully closed. It seems to make a big difference. I’ve got a lot more wood in my stove than you have because I had just loaded it up before heading off to bed, turning it down and then remembered you. When turned down, you can see the dancing flame effect. When turned up, you can hear the stove clicking as it heats up. I think it might be worth emailing Phil.Wood@contura.eu. I emailed him before buying the stove to check if I needed a vent and he was really helpful. Anyhow, here is the video. Thanks for taking the time to post this video and for the contact. I will e mail Phil tomorrow and see what he says. I’m very jealous of your fire! Thanks for the offer to come and see your stove. That’s exactly what I need to do but I am in West Cornwall! It’s a brand new stove and at the moment we are trying to work it out with stove dealer and fitter as unfortunately they are different people. we have checked the damper control and it seems fine so it looks like it might be the flue producing too much draught. Hopefully it will get worked out eventually. That does look a little odd as when I turn the lever to the left and onto its lowest setting the change is quite noticeable: the flames really die down and there is a lot more soot produced. One thing I forgot to add is that I seem to recall that there is an ability to limit how restricted you make the airflow and that fitters will adjust this dependent on whether you live in a clean air zone. Maybe your stove has been set up too conservatively and the range of adjustability that the stove is capable of has been restricted. Just an idea and I may be talking complete nonsense. James or anyone with a 51L can I ask how long you are able to keep your fire in if you leave it? I’m not interested in leaving it to slumber overnight but how long will it slumber for? I know the Clearviews will happily go the whole night and relight in the morning. How about the Contura. Two hours is about the most I can get with mine and that is pushing it but as described above I seem to have a dodgy one as it is always burning hard. Basically I am trying to decide if I should cut my losses and get a Pioneer 400 as 6 weeks in and I’m still not getting any real support to fix my fire. I really think that you have something wrong with you fire installation. Have you talked to the person that installed it? Any fire that I have in the Contura lasts a long time. I’ve been able to slumber it overnight. I think you could try contacting Contura. Email Phil.Wood@contura.eu – he can probably help you out. Out of interest, who fitted your fire? Hi James the fire was fitted by a local fitter who has been excellent throughout, even the fire supplier agreed that the installation was good. Also Phil Wood from Contura has been amazing, to the point of offering to replace the fire! If all customer services were as good as Conturas life would be easy. It’s certainly reaffirmed forme why I chose to buy Contura. Hopefully the flue damper will fix the issue and if not a new fire. Brilliant! I’m really pleased Phil was able to help. He answered some questions for me that I had about the stove before I brought it. Great info as I’m trying to decide on my first stove. Being new to this, I’m interested as to why you say “… a Clearview Vision 500 then you need an air vent but can’t achieve 8kw.” Why couldn’t it achieve 8kw? Just looked at your review and agree with you comments. Nice modern looking stove which burns cleanly and keeps the door glass clean. If you want to make door opening more convenient, simply lift the spring away from the tab on the top left hand corner of the door with a pair of pliers and let it spring back carefully against the stove and leave it in that position. Now you don’t need two hands to load the stove. A Contura rep informed me that the sprung door is a legal requirement in some European countries, but obviously not in the UK. If you are worried about safety, simply attach the spring back to the door tab – it takes seconds. Thanks for the feedback. It’s great to know that can remove the spring from the Contura door. I’m going to give this a go. Great stove review… I am considering getting a Contura 51L. Just over two year years later, are you still happy with the stove James? Do you ever run into issues with the stove, such as the vermiculite fire bricks breaking and needing replacing? Yes, still really happy with it. The glass is keeping clear and it runs really well. None of the bricks has broken and I haven’t had to fix anything yet. Update from me. One year ago Contura agreed to replace my fire. New one went in and instantly was amazing. Full control of the burn rate and everything I knew it was meant to be. Full marks to Contura for offering to replace the fire. I’m not sure what the issue was but the new one is completely different. Very happy with it one year in. That’s cool. Really pleased it worked out for you. I’m quite looking forward to the winter coming now.